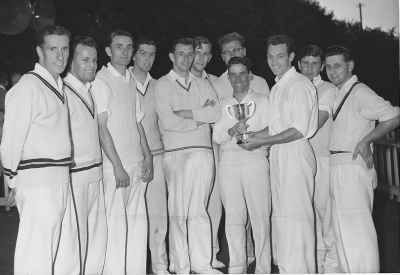 The photograph shows the author of the following article and captain of Tewkesbury CC, the late Cliff Burd, third in from the right holding base of the cup. Others are, numbered from the left: 1. Tony Collins 2. Maurice Sollis 3. Brian Devereux 4. Anthony Poole 5. Tony Norman 6. Dr. Graham Shephard 7. Tom Crisp 8. Peter Fox 9. Cliff Burd 10. David Haines 11. Ken Haines. We are told that allusions to cricket may be found in documents of Edward the First. It is also stated that the game evolved from Club-Ball, or Stab-Ball, or that some long-dead shepherd, using a hurdle or wicket and a rolled-up ball of sheep's wool, gave the game its origins. Suffice to say that we are able to boast a set of rules laid down in 1774, every one of which is quite workable today, giving the game an honourable pedigree which could only have been established by Englishmen. The laws were crystallised by expedience and experience; they worked! They evolved because it was common sense to change them. It is not too difficult, therefore, to imagine cricket being played on the Ham with a hurdle and a ball of wool; from there we can trace its growth and development to today's sophisticated game. The formation of Tewkesbury Cricket Club in an identifiable way is difficult to pinpoint. The earliest record available is to be found in Bennett's Register and Magazine for 1845, where he states: “The Tewkesbury Cricket Club, which has been established several years, was this season carried on with more spirit than on any former occasion, the members having played no less than four games with other clubs”.These were against Severn Stoke, at Bushley Common, Worcester at Pitchcroft and at Bushley, Winchcombe at Bushley and a return match at Severn Stoke, with Tewkesbury winning two and losing two. Sadly, there are no details of the players or of the scores. Early records of the club are virtually non-existent, and most of the information discovered has been found in the Tewkesbury Record and Tewkesbury Register newspapers. When it was first formed, the club did not have its own ground, but played where it could in and around the town. Certainly the Ham was used, not only by the Town club, but by many others too. The ground at Mitton Leys, owned by a farmer, Aaron Pike, was used quite often, sometimes for a fee, but usually free of charge. In 1860 matches were played “in a capital field near the Barton Street at a considerable outlay”. Other sites included a piece of meadowland alongside the Ashchurch Road, but in 1869 Mr. B.T. Moore, owner of the pasture known as the Swilgate Meadow, leased the ground to the club on an annual lease. This has been the club ground continuously since that date. At some time after this the ground came into the ownership of the club, and before the First World War a sports club was formed, with tennis and bowls being played there. At this time the Healing family, of Healings Mill, were heavily involved with the club. They gave employment to one Joe Crisp, who was the groundsman in the summer and worked at the mill during the winter. This Sports Club lasted for a number of years, but about 1938-39, with war imminent, it was dissolved and the ground was sold to the County Council for use by the secondary schools in the area, with the club retaining the use of the ground on a rental basis. During this period the control of the ground was in the hands of the Headmistress of the Girls High School, Miss Craighead, who exercised that control quite rigidly. When the school had a sports event or an Open Day, although the ground might not be in use, the club had to cancel its match. Sunday games were very rarely approved, especially as the Club President was Canon Purefoy, the Friar Tuck of Tewkesbury Abbey. There were benefits, of course; the school handyman, Snowy Booth, acted as groundsman, ensuring that the grass was cut regularly with equipment owned by the school. During this period the club was unable to provide a bar or any social facilities for its members or the visiting teams. As a consequence, it was unable to attract new members, especially those looking for the social aspects of club membership. The pavilion changed very little after its purchase in 1899 at a cost of £166! It was lifted above flood level on wooden stilts, but about 1920 they were replaced by brick pillars and the whole raised higher. A lesson had obviously been learned! A small changing-room was built onto the left-hand end of the structure, and part of the underneath was enclosed to provide a storeroom for equipment, but apart from this it remained almost unchanged until its replacement by the new brick-built clubhouse in 1992 [actually opened in June 1993]. For many years there was no water, gas or electricity laid on, so there was little in the way of teas or refreshments in that period. There have been many famous players associated with the club; perhaps the most famous was the great Dr. W.G. Grace, who, according to his researcher, played at the ground on three separate occasions. Gilbert Jessop, of Gloucestershire and England, not only brought county sides to play against the club, but also played for Tewkesbury himself. He was renowned for big hitting, and on one occasion he put a ball through the pavilion window! Alf Dipper and C. Parker, both county players in the early 1900s, were both with the club when taken up by the county, and in 1902 Parker became the club professional. 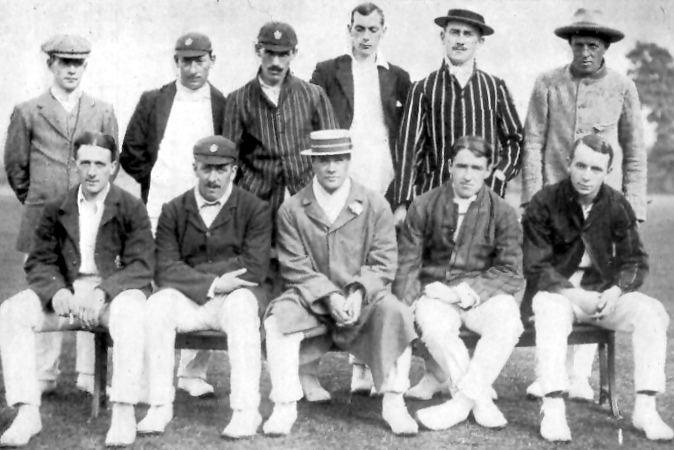 The first professional had been a county player named Gould. In the same year a groundsman was employed; the cost of both men amounted to £28 for the year! Thereafter professionals were used by the club until the 1930s. Although early records are quite sparse, some fascinating items have survived, and, judging by the low scores and sometimes spectacular performances, it is obvious that grounds were not prepared to the high standards required today. August 1878: An amusing match took place on the Swilgate between six of Tewkesbury using broomsticks and twelve juniors selected from local clubs using bats. However, the strength and experience of the six was too much for the youngsters, some of their bowling being driven great distances! 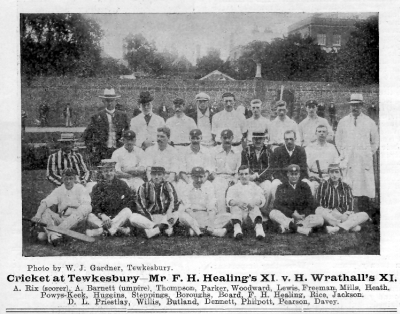 September 1879: Tewkesbury played Apperley, the match being notable for “the fast underarm bowling of Butterworth”. 1893: In a match against Leckhampton, “Rice joined Priestley, who was in rare slogging form, and having made 29 out of 56, he then had to retire on account of a business engagement.” Rice was the professional and Priestley was Headmaster of the grammar school. It was in this year that Jessop first played for the club. 1895: Whilst playing against Hatherley at the Swilgate, Wright of Tewkesbury hit two balls to square leg which pitched in the top of the mulberry trees and landed on the Avonbrook lawn. 1896: A thousand spectators turned out for the Whit Monday game against Malvern. In this year there was some doubt about playing the Gloucester game because of the smallpox epidemic, but it was decided to grant them leave to visit Tewkesbury. In the same year there were five Healings playing in the same team! A collection box was introduced for the first time, and £1.2s.6d. was collected, a substantial sum at the time. Against eight men of Evesham, the Town turned out with G. Jessop and Rice, the professional, amongst their team, Jessop taking 7 wickets for 13 runs and breaking one stump into several pieces! 1898: Heath, a local man, played for the County against Nottinghamshire, taking two wickets. 1899: Jessop, Bassett and Troughton, the professional, were all asked to play for the county side. 1903: Against Tewkesbury Grammar School, in July, J. Priestley, the Headmaster, and his son R.B. Priestley put on 120 runs together. The father received a blow in the eye which destroyed the sight in the eye for several days, but continued to score 87 runs! They certainly made them tough in those days. 1904: Iron railings were put around the ground, and a gate was placed at the entrance. At the outbreak of war the railings were taken for scrap, but fortunately the gate, having been made by Walkers, the local engineers, was saved and has now been erected, complete with two cast-iron posts, at the new entrance to the ground. A link with the past has happily been saved. In this year there was a famous match against Overbury. Before the match, the Overbury men were in the hairdressers, where legal betting was allowed, and were taking all bets at long odds that they would win. The reason was that they appeared with Arnold, the Warwickshire bowler, in their side! "Arnold made 41 before his stumps were broken by Browning, the town's fast left-arm bowler! The town's regular batsmen failed and the match looked lost when Mayall, the carpenter, and Williams, the postmaster, took charge. They added 75 runs and Williams hit Arnold through a window on the Swilgate bank, play being suspended while another ball was found, since the owner of the house refused to give up the ball until he had been paid for the window." During this year the Bowling Club transferred to the Swilgate ground. This would have been the time that the Sports Club was formed. 1907: There were two benefit matches this year for the groundsman, Joe Crisp, and a list of players who had not paid their subscription was put up in the pavilion. Nothing changes! 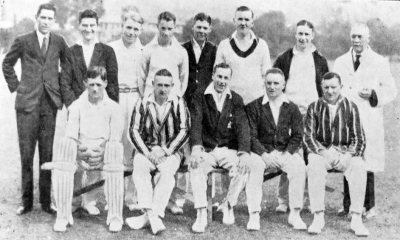 More recently, however, the club has been graced by great players; Godfrey Evans, of Kent and England, scored his maiden century here in a match against Gloucestershire ends. Since the war, Arthur Milton, George Emmett, and Barry Richards and Mike Procter of South Africa have all trod the turf here. The club has entertained the county side on a number of occasions, providing Benefit Matches for the long-serving players at Bristol. In 1971, the year Tewkesbury held its celebration of the Battle and the consecration of the Abbey, a unique match was played here. A match between Yorkshire and Lancashire was played at the ground, the only time that the two teams had ever met outside their own counties. A feat unlikely ever to be repeated. With the building of its fine new clubhouse, the club looks forward to a period of growth and success, which will restore the club to its former position of one of the premier clubs in the county. Who played Cheltenham on Saturday last, making a good score of 170. The match was drawn by rain. Standing.- A. Adkins (scorer), C. Neale, R.E. Green, P. Smith, T.B. Hitchman, R.H. Williams, W. Heath (umpire). Seated.- J. Goodwin, C.H. Chatham, E.G. Morrison (capt. ), A.T. Young, C.S. Barnett.